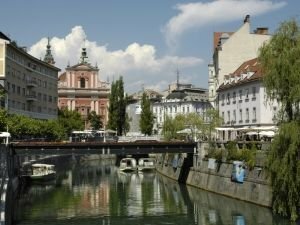 It is often said that Ljubljana reminds of Prague with her beauty, Salzburg - with its symmetry and order, and Paris due to curvature of the picturesque River Ljubljanica, above which line up one after another beautiful old bridges. Ljubljana is the capital of Slovenia, situated almost in the center of the country. With around 330 000 inhabitants, Ljubljana is one of the smallest and newest EU capitals. Located between the Alps and the Adriatic Sea, in the pool where Ljubljanica flows into the Sava river, Ljubljana has all the features of a modern capital, but nevertheless manages to maintain the friendliness and charm of a small town with an incredibly peaceful atmosphere. The outskirts of Ljubljana are filled with natural beauty and cultural landmarks that testify to the city’s dynamic history. They keep many hiking routes on which you can feel the legacy of crossover here by Slavic, Latin and German cultures. It is assumed that the city was named after the river Ljubljanica, but from the Middle Ages until 1918, the town and river are named after Laibach. Ljubljana stands at the crossroads between Central and Southern Europe. Historical sources testify to the first mention of the city as a Slovenian village in 1144. But at the dawn of new era here there was a Roman colony of Emona here, which is evidenced by archaeological evidence found from 1-4 century. After a very turbulent history, today Ljubljana is probably one of the most peaceful and friendly world capitals. The facades of old houses around the city glow in the warm colors of orange, beige and ocher, and their bright red roofs add further charm. After a major earthquake in the 19th century, much of the urban architecture is revived thanks to the Austrian architect Jože Plečnik. Main marker for orientation in the city is Ljubljanica River, which passes through the central part. With its two sides lining up, the exciting baroque buildings dominate over the ramparts of the ancient castle on the hill. The old part of Ljubljana takes mostly the east coast, while the new modern part extends along the west coast. The old bridges over the river are one of the landmarks of the city. The most famous of them is probably Triple Bridge / Tromostovje, also designed by architect Plečnik, as is Dragon Bridge. Among the important places in the capital of Slovenia is the Republic Square, where Slovenia declared independence from Yugoslavia in 1991. Previously, many significant events in the country have passed through the square, on the other side of the street is the Parliament of Slovenia. Its facade is decorated with remarkable naked statues. You cannot visit the ancient Ljubljana Castle and not climb its tower to see the beauty of the city from above. Built in the 12th century as the residence of the Counts, today the castle’s visitors can enjoy historic 3D screenings, telling of the city from prehistoric times until today. Among the notable buildings in Ljubljana is also St. Nicholas Cathedral, St. Peter's Church and the Franciscan Church of the Annunciation. At the west end of town and is the main city park Tivoli, which is different from the Tivoli amusement park in Denmark, and west of downtown are the Roman City walls, keeping many other columns. Interesting to visit is Metelkova City, which is located about 5 minutes from the railway station. It is something of a self-proclaimed cultural center. This is a center of alternative culture artists to Ljubljana, a favorite of many youngsters. Here you can find pretty bars and nightclubs, occupying the buildings of the former military barracks.